One of my favourite Raymond Chandler stories is called, What We Talk About When We Talk About Love. It is largely dialogue between couples talking about love around a bottle of gin as the sun goes down. Every one is sure of their own idea of what they mean when they talk about love, but the more they talk, the more confused they become. The title of the short story comes to mind when we talk about Beaujolais. 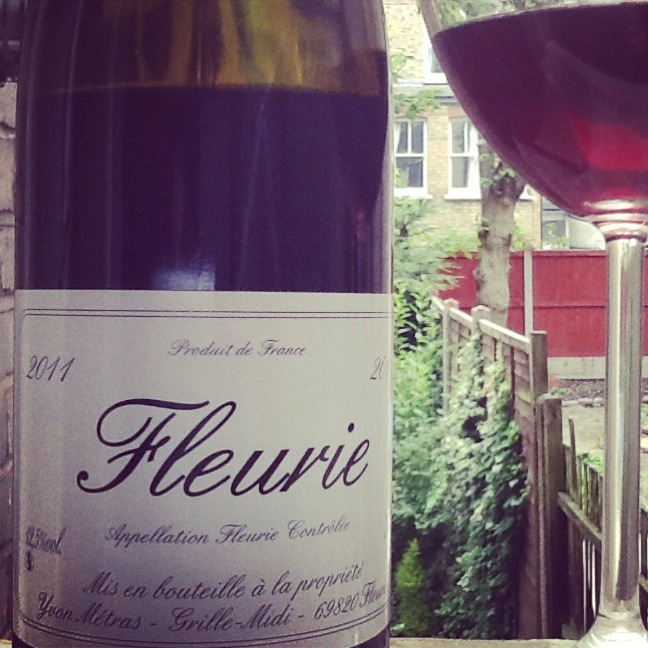 What are we talking about when we talk about Beaujolais? Funnily enough, if you see Beaujolais featured on the front label, then this is not what I am talking about here. These are either Beaujolais or Beaujolais-Villages. Nor is it the wines you see during Beaujolais Nouveau on the third week of November. What I am talking about is Cru Beaujolais – labelled with the name of the cru rather than the word “Beaujolais”. The ten cru are: Brouilly, Chénas, Chiroubles, Côte de Brouilly, Fleurie, Juliénas, Moulin-à-Vent, Morgon, Regnié or St-Amour. You can throw a dart at the 2009 and 2011 vintage and find great wines. But the 2014 vintage is not one of those vintages. As a very general rule, it does not have masses of juicy fruit, but instead, is highly aromatic with silky tannins and a fine structure. The difference in the 2014 vintage comes down to the cooler weather in Summer and the slow ripening in September. Jean Bourjade, managing director of Inter-Beaujolais, explained the 2014 vintage started hot and sunny in Spring with flowering taking place at perfect temperatures in June. In August, the ripening slowed down again because of rain and lower than normal temperatures but ended with an Indian Summer. The long sunny days and cool nights allowed a steady and slow maturation of the grapes with vintage starting on the 8th of September and lasting three weeks. One way of putting it: if you prefer your Cru Beaujolais closer to Burgundy than Rhône in style, then the 2014 vintage is for you. Less emphasis on the juicy fruit in the 2014 vintage is not such a bad thing for appellations such as Brouilly, Morgon and Moulin à Vent. In 2014, the bigger styles of Cru Beaujolais show remarkable finesse and will age well. There is a move by the producers towards “single plot wines” as Jean Bourjade says. This is a step towards quality for Cru Beaujolais that is also echoed in other fine wine regions, such as Barolo and Champagne. The distinguished ambassador of the single vineyard style of wine in the Cru Beaujolais is the Cote du Py in Morgon. A couple of years ago, I would take the Eurostar to Paris to get my Cru Beaujolais fix. Most of the natural wine bars in Paris featured the top Beaujolais winemakers as if they were rock stars. They are now more well known here but it is still hard to find much quantity. Now I think most of it is snapped in France – the top winemakers, including the Gang of Four (or five if you include Métras – in the photo above), only produce in tiny quantities. Some of the independent shops have started stocking them but never in huge quantities. The two regions are very close, especially for the young winemakers in the Macon who often hang out together at the same natural wine fetes. But it is not only in the Macon where the impact of Beaujolais is felt. The young generation coming through are experimenting with carbonic maceration and whole bunch fermentation, including traditional producers such as Arnoux-Lachaux. Can the original distrust be traced back to the Duke of Burgundy in 1395 banishing the “disobedient” gamay to south of the border? The next generation, who have worked outside Burgundy and educated around the world, are breaking down the walls between the two regions. While Cru Beaujolais in the North is gaining more recognition, the Beaujolais and Beaujolais-Villages growers are stuck with the tag of Beaujolais Nouveau, a cheap and cheerful wine for a booze up (but also a huge part of their revenues). There are some moves by the Beaujolais body to apply for sparkling wine recognition in the South. Hopefully the new income from sparkling wine will reduce the reliance on cheap bubblegum wine and help the whole region focus on their tremendous qualities. While it is exciting to see some of the younger Burgundy winemakers experimenting with the Beaujolais style of winemaking, I hope that we don’t see another influence the other way: the inexorable rise in prices for Cru Beaujolais. Right now, the best ones are one-third less than their comparable Burgundy counterparts. But they share a similar problem: it is hard to find much of the great stuff. In the 2014 vintage, the total volumes increased 10% across the whole region, although this will not mean much for the great producers. It is still small scale. I think what saves the region, even for the best producers in the Cru Beaujolais, is that they make wines to be enjoyed and opened (even though it is possible to cellar for up to 40 years). They have not become part of the wanky fine wine worship system yet. Drink up. Enjoy. It is wine at its best. That’s what we are talking about when we are talking about Beaujolais. Love. Gamay Beaujolais: 16 322 hectares (30 000 hectares planted in total in the world), representing 98% production. Chardonnay Beaujolais: 250 hectares, around 2 % of the production. Split between caves cooperatives and independents: 3 000 producers, 12 cooperatives, 169 negociants (Beaujolais, Mâconnais, Bourgogne). Average Vineyard Size: 9,8 hectares. Number of appellations: 12 (10 Crus: Brouilly, Chénas, Chiroubles, Côte de Brouilly, Fleurie, Juliénas, Morgon, Moulin-à- Vent, Régnié, Saint-Amour; Beaujolais and Beaujolais Villages : these last two are produced in three colours and as a primeur). • Export represents over 40% of sales overall. • United States : 48 676 hectolitres / approx. 6 490 000 bottles. • United Kingdom : 36 507 hectolitres / approx. 6 500 000 bottles. •Canada : 28 428 hectolitres / approx. 3 781 000 bottles. •Belgium : 12 978 hectolitres / approx. 1 730 000 bottles.